This Fertile Heart Mama was part of our European fertility support circle for four years. During that time, I don’t think she missed more than 2 circles. She also traveled to our Woodstock Studio from Europe to attend not one but two workshops. This is a comment she wrote in response to my How Infertility Can Help Save the World Blog. I share her note in celebration of Mother’s Day and as a stunning illustration of what the Fertile Heart OVUM practice is really about. It’s not about the number of years we spend “meeting our child halfway.” It’s also not about how we eventually birth our family or even whether we ultimately choose to be parents to a child, or learn the toughest of all parenting skills, the art and skill of parenting ourselves and staying busy being born. I hope you’ll read Ch’s post, and then it’s your turn. Which part of you is most fervently calling to be born at this stretch of the baby making trek? I gave birth to our beautiful son. We used high tech intervention to get pregnant but I know in my being that your work (Fertile Heart OVUM Practice) meant that after so long, my body and soul were receptive to a full term, healthy pregnancy. At 47 I defied the odds and had a beautiful pregnancy, with no complications. Part of my journey to motherhood has made me ask some of the tough questions about our legacy and what we do whilst we are here. As the world feels like it is shifting to toward less and less tolerance, voices of reason and acceptance are ever more important. about the impact on the world in which we raise our son. In making conscious decisions I hope that we will raise a man who has his own passions and pursues them with the same determination that brought us to him. I am proud that I chose the path of preparing myself for motherhood. Now that I am here, I feel the depth of my preparation like a comforting blanket. Wrapping me in layers of acceptance and enjoyment, built over time as I soul-searched my way to a little boy who is the light of my life. to decide what you stand for and to make decisions that change lives in small ways that I think make a difference. I am not normally a big consumer but suddenly there are things that you need to buy, whether it is a cot and mattress that you decide to buy made from natural wood from a small family firm created with formaldehyde free glue or an organic wool which had not been treated with fire retardant chemicals. Buying toys that are manufactured in excellent working conditions with sustainable, non toxic materials. You are forced to join the debate on vaccinations and then later schooling. In order to raise a well rounded, thoughtful young man, I am forced to become better versions of my current selves, birthing the next me who has the strength, wisdom and compassion for the next stage. A friend said some time ago that I had changed on this journey. She presented it as a negative comment but I am so delighted by the gift of change. It is a chance to really live, to be truly fertile. It brings to mind Ghandi’s saying “You must be the change you want to see in the world”. On our fridge we have several of your beautiful poems including the one called Busy Being Born. I read that poem at our son’s recent baby naming ceremony. 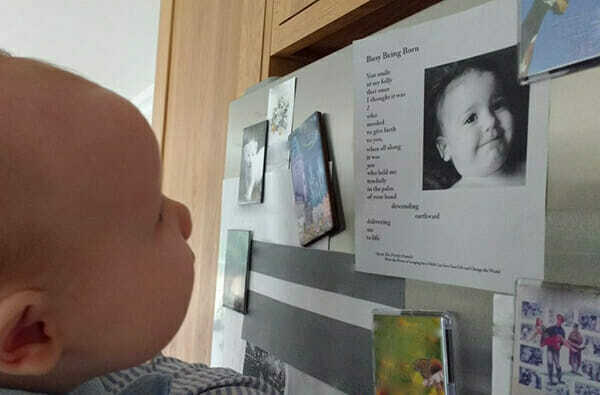 We have a picture of your daughter with the poem and every morning our little boy smiles at the picture of your daughter and I feel my connection with you and our fertilehearted community. We truly can change the world as we join in strength and love. Thank you for posting the link to the Leonard Cohen song. I love the lyrics. I was reflecting the other day when walking what I am enjoying most about motherhood. There are many wonderful experiences. The overwhelming feeling is an intensity of love that at times, almost feels like insanity. A physical love and connection like nothing that I have ever experienced. An aching that makes me a more connected, alive person. I know that a love like this can only make the world a lighter place. I also know that the pursuit of such love also makes the world a better, more accepting place which is so desperately needed in these strange times we’re living in. Take good care all. Much love and light! Thank you for sharing this inspiring story Julia, for it feeds my soul. I celebrate in this beautiful Mama’s tenacity and success and feel such happiness and hope reading her words. Not just for me, but for all of us striving to birth our best and whole selves. Today, I was walking down the street, noticing the warmth of the sun shining on my skin, noticing that my body feels loose, relaxed, and I realized that my body rarely ever feels loose and relaxed…this feeling is new. I started to reflect on that fact that the changes I experience doing this work materialize in very subtle ways; in a reaction that is different than it used to be, or in the recognition that I feel different inside in response to a stimulus. It is the revelation in some discreet moment where I notice that the orphan is no longer the loudest voice in the arena, whatever that arena happens to be. With each embrace and acknowledgment of my full self, I am learning to trust myself, and I’m enjoying the very new feeling of relaxing into it. As many of you have described, I have harbored that fear that that my body is failing me, that it is not working properly, that it needs to be fixed. I now know in the deepest recesses of me, that my body is my greatest ally, that it is here for me, signaling what is needed for my healing… that the universe is for me, that time is on my side and that nothing is more important for my well-being and life ambitions, than me first learning how to mother myself. I feel so thankful for all of you, and for this nurturing forum for sharing and learning with each other. What a gorgeous post! We are 2 years and 2 miscarriages into our baby journey and this idea of being more mindful really resonates with me. I am finding that with each hurdle and each stumbling block I have this strong desire to create the next, better version of myself rather than relying on a “quick fix.” I am learning to trust my intuition and listen to my orphans more. Yesterday I got some blood test results and the nurse suggested that I start some medication so that they can “have better control” over my body. My first thought was, how can this doctor, who I’ve met only several times for a few minutes each time, know how to control my body? I was angry and confused and decided that it was best to hold off on making any decisions until I could speak with my orphans, visionary, and ultimate mom. This is such a shift for me to be able to question what I’m told and try to understand what makes sense for me. This practice is definitely changing me and I agree with the original post that I think it’s for the better! What a beautiful and inspiring post – thank you. Such a great reminder of all the benefits of this journey, now matter how long. I have those days when I think: Surely I’ve learnt enough now? Surely I’ve got enough out of this process? Can’t I just have my baby now? But this post reminds me that there is always more to learn and discover. It reminds me of the start of the Fertile Female when Julia talks about the amazing landscape of treasures she finds on her infertility journey – there is not just one end goal of this journey, but it’s a process with so many gifts along the way. We just have to keep walking and keep birthing the next amazing version of ourselves. Thanks for the wonderful images and the inspiration. This is such a beautiful and inspiring post. My last couple of months have been full of self doubt, particularly in relation to work and what I do in this world. I have realised how much value I place on what I am doing, how I so often compare myself to others, worry if I am doing enough or being enough, or am successful enough. I worry that I am simply not good enough: not gifted enough, not as good as others. While this self doubt has always been there, simmering away in the background, sometimes bubbling up a bit more, I have never felt quite so swamped by it as I have been recently. It’s been tough, and I suspect it has – in part at least – been triggered by the challenges of the baby-making journey. However, it has also given me a chance to really examine these orphans. To see how unhelpful it is to live life dominated by them, and how much it hinders my ability to feel free and creative, in the flow of things and joyful. So, the part of me that is being born at the moment (and it’s feeling like a slow & painful birth!) is the visionary who trusts herself and her life, and is able to grow into the fullness of who she is and embrace the richness of life, rather than be dragged down by the hyper-critical orphans. I often have an image of a sunflower who is allowed to grow tall and reach up towards the sun. I love this post – and also Sofi’s addition of the Pema Chodron quote. I have read her writings in past lives – always when there was some kind of deep anxiety I needed to soothe. I look back on the anxieties of those times (which had nothing to do with children) – and realize that all I needed to do was stay on the path of self-love and deep honesty with myself and the answers would be revealed. I am truly starting to trust that wisdom with this journey (though of course my orphans get the best of me some days). I’m seeing the fruits of my labors in recent weeks, where I’m addressing parts of my life that really needed attention but weren’t going to get it unless I was really, really desperate and uncomfortable. For me, that is usually what it takes to make serious change. That is why I am truly greatful for this journey and heartened by the story above. Of course I’m heartened that she was 47 years old – but I’m even more heartened that she worked so hard for so long to get to where she is. I’m realizing that I just needed more time than I thought to really get this process – to really understand in my cells what it was about. Since I was rushed a lot as a child, and often rush myself – I see that truth now as healing in and of itself. I’m taking time with this process to heal my life. That’s no small task so I’m going to give it lots of room. I’ve put off the idea of doing IVF or Egg Donor right now because I want to, need to stay on this path and see what my life looks like in a few months. Since getting into couples therapy my marriage has become so much warmer and closer. My resentment and fear is melting away and I feel a kind of letting go in my body that I didn’t know was possible. So – this post comes at a great time. It is cheering me on to continue my work and allow myself lots of hope. The deeper I get into the work, the more hope I allow myself to have. I actually composed a comment in response to the Mother’s Day post from 1 May but just realized that it does not accept new comments. So this has become a lovely opportunity to also comment on Ch’s thoughtful words you shared with us, Julia, and to celebrate her little boy. I am sure she would have been a wonderful Mum to him in any case, but the longing and the journey have clearly added a dimension to her mothering that he is incredibly lucky to experience. I’m really happy for you, Ch, that you and the little one found each other. I know this is an older post but it opened my heart today, on this day when we often steel ourselves and reinforce our armour against the Mother’s Day images and celebrations. Like last year, my period cramps again show uncanny timing and have started in time for Mother’s Day, but I have filled my day with deep breaths and as little orphan-rooted panicked action as possible. I chose to create and mend instead. I have a sewing machine that has been tucked away for twelve years, and a head full of creative plans and projects, and a stash of beautiful fabrics I have collected. Today the sewing machine finally came out of hibernation. My husband dug it out and set it up, as a co-creator, and as a start to his creative day of gardening. With the help of a friend I managed to spiritually reconnect with the sewing machine and get it threaded and going. The creative energy flooding through me during this process felt like a cleansing, uplifting wave, and Mother’s Day seemed the perfect day to pave the way for colourful fabric creations and to remove those perceived obstacles that had somehow been holding me back year after year (Will the machine still work? Can I cope with the frustration if it doesn’t? Where do I take it if it doesn’t work? Will I know where the manual went? Can I thread the machine? If a needle breaks, where are the spare needles?). It felt like a tick list of steps to get me closer to creation, and I worked through it one by one, and now have a working creation tool set up on my desk, ready to go. This evening I did your Mother’s Day visualisation, Julia, with my favourite essential oils candle (made in a monastery) and hand-mended a favourite bag. I got it wrong at first, unpicked the stitches and kept going even though I was fed up, so now the bag is mended, it’s still Mother’s Day but I now feel that it has been an opportunity for manifesting creative energy in lovely ways. I was moved by what Gravid Sans Doute said in one of the earlier comments, and agree that today is a good day for looking at what I have and what I am good at instead of focusing on what is lacking. It is really hard for me to think that way because I have a natural tendency to feel insecure and to despair easily, but I am also intensely aware of good things in my life. I often think that being easily hurt also has its benefits because the capacity to feel deeply transfers to appreciating friendship, love, kindness, beauty and energy. I choose to focus on light today, despite the pull of the shadow, and I will try to do so one day at a time. This was a lovely post, especially the use of the word “journey”. On Mother’s Day it is difficult not to listen to the orphans. Reading this post helped, especially to help us realise that our journey is making us stronger, more patient, and ultimately better parents. Each imagery or visualisation that we do each day is making the journey more real and tactile. If we can see and feel the changes in ourselves throughout our journey, we will have greater confidence that we will be parents who have truly met our children halfway. I just found this quote at the end of a friend’s email message, and it fit the topic of the blog really well so I wanted to share with you all. This is a great reminder of the process of birthing our next selves. Thank you for this beautiful post and the recent one on Mother’s day reminding us that we are mothers even if our child has not come to us yet. I really appreciated this post which I re-read several times. It is so encouraging and inspiring to see what living the Fertile Heart practice really looks like. I too am 47 so it definitely helps to see someone else at this age who had a healthy pregnancy. I still battle the age orphans questioning whether I can physically handle a pregnancy at my age and then raising child afterward as I will only get older. But something in me is urging me to continue on this journey. I also re-read some of the older comments in the last blog and was reminded of a situation I am facing now where I just learned of a friend’s pregnancy with twins who is only a few years younger than I am. It made me sad and jealous to hear it at first, and I remembered Julia saying years ago on a call that I needed to turn that jealousy into fuel and that it can be a hopeful sign. And one of the other moms mentioned imagining these pregnant women as helpers in Field of Creation encouraging her to keep going on the journey. I have been using Field of Creation for the past few weeks, mainly because I have been struggling with difficult emotions and orphans. In the imagery, I am starting to see the beings that keep the orphan in its reality, but the helpers have not been so clear. So I plan to try this new approach, my pregnant friend as a helper in this imagery, to help me move to the visionary side of the field. The part of me calling to be born is the one who can be a good mother to myself, and especially who can set limits with my orphans and make self-care a priority. For the last month or so, self-care has been very low on my list, and I have focused on my job and other aspects of life and forgot that I have to take care of myself before I can take care of others. It’s time to make a shift, and to think about what would I say to my own daughter in a similar situation. What a beautiful post!!! I felt so connected with this fertilemum including our journey to meet our beautiful children but she sounds more like an Ultimate Mom right now :). He strength, her visionary actions and thoughts and feelings can be felt in every line she mentioned and are very thought provoking. Thank you so much for sharing her thoughts Julia!! I feel so bad that after doing all the beautiful imagery exercises for all those years, I am again falling prey to so many orphans. Currently the part of me that feels neglected, gets angry and starts hating people (for things they have done) wants to be heard and be healed, as it is high time to let go and free up the space for filling myself with love, empathy and some compassion. Thanks a lot Julia for this beautiful post. This post is very beautiful. 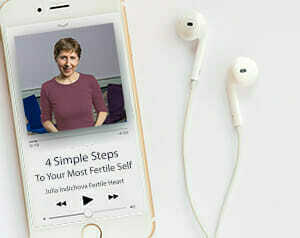 As you said, it is what the Fertile Heart journey is about, technology or not. What is burning to be born in me is the faith/trust that all is well- that it is good to take moments to care for myself. I have been walking the path of more busyness than I am comfortable with. It is a test of my faith to just show up to my class and my part-time job, and trust that I will be able to move forward. I have been doing the Wailing Wall Fertile Heart body truth and Learning How to Ask Fertile Heart imagery. In the end, striving to see the good in those around me pulls me through. And, as Julia encouraged me, to see the good in me!